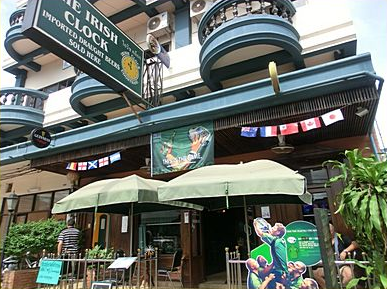 The Irish Clock Guest House offers multiple facilities including a tour desk, a limited hours room service and a dry cleaning service. Above all of this though, the Irish Clock is very close to the Day and Night complex, right in the centre of the ferang nightlife. Wireless internet is accessible within the guest house, a full English breakfast is served every morning, with a number of dining options which can be found nearby on the adjacent streets and at Central Plaza. Dinner is served daily at the guest house’s restaurant, and the guest house also has a lounge bar. Rooms are available from around 1300 baht per night.